Oxblood (a term that kind of gives me the creeps) may be the "it" color of the season, but my favorite Fall hue is definitely mustard. It's an odd color, isn't it? I wouldn't classify it as a typically pretty shade. However, there is just something about the way that it pairs with other things. I love it with neutrals, but I also love it with brighter colors like blue and hot pink. Now that the weather has cooled down slightly here in SoCal, I couldn't wait to break out a snuggly soft cardigan to throw on for a casual Sunday evening. The sun was setting as these pictures were taken, and the sky outside my window was ablaze in a fiery mix of orange and red. That blouse is super cute, especially with the mustard sweater! Love the mustard shade on you...I'm very intimated by yellow and greens and anything in between but mustard could be worth a try for me too. How do the Old Navy jeans fit? I love jade too! Deep hunter green and emerald are gorgeous for Fall. The Old Navy jeans are very comfortable and stretchy. However, the sizing runs small. I had to go up two sizes in order to fit comfortably in them. This is my first and only pair from ON. I do like them, but I understand the frustration that I've read on other blogs about the sizing. I love everything about this outfit...the cardigan is the perfect color, your clutch, that necklace...love! So pretty! I personally LOVE some mustard mixed with brights & neutrals. It's seems like mustard can do no wrong when paired with other colors. I love mustard too but unfortunately it looks terrible on my skintone. Looks great on you though! I love the colour of your RM too! The blouse and cardigan are super cute together! Love the colors! Mustard is my favorite color for fall too :) Love the nail polish color! I bought this same sweater and I love it! I can't wait to pair it with more than just navy. Thanks for the ideas! Mustard isn't the easiest color for everyone to wear, but you look fabulous in it! I like that necklace a lot and how it brings a different color in so well. Love mustard and LOVE that nail color! You always look great! Don't forget to enter my giveaway on my blog! I'm loving jade and oxblood. I am loving the cardigan and that nail polish is pretty too!! I have never heard of Oxblood before. But I like the color. 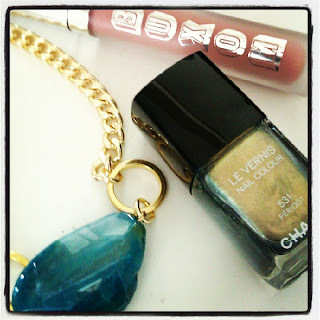 Loving the gold fingernail polish, I have a silver on right now...great minds think alike with the rich tones! Oxblood is another term for burgundy or wine. Am I right?! I believe it is anyway. It's just a very deep, dark red. I love the color, just not the "oxblood" reference! I totally have to agree with you on this one. I don't particularly like the color Mustard per se, but something about the way it looks against other colors in outfits is always fantastic. Love this mustard and turquoise color combo you got going on!